To apply for a divorce in Mississippi, you must meet the state’s residency requirements. You or your spouse must be a resident of the state for a minimum of six months prior to filing the divorce petition. This enables the court to obtain jurisdiction over your divorce. If you do not meet this requirement, you may need to wait if you wish to file for divorce in Mississippi. No standard divorce form exists for the state of Mississippi. However, many local courts have created their own template or form you can use when filing within their jurisdiction. Therefore, contact the court in your county to obtain a divorce form. Most divorce forms ask for basic contact information about you and your spouse, and the reason for your divorce. For a divorce citing irreconcilable differences, a Mississippi court will not grant the divorce until the minimum 60-day waiting period has elapsed. In addition, you and your spouse must both join in the complaint requesting the divorce. The property settlement agreement is a document entered into by both spouses that conveys how they would like their marital property distributed following the divorce. For example, you and your spouse may specify which spouse will receive the family home in the divorce and how any retirement accounts will be distributed. This document is usually filed with the original joint complaint. The joint complaint for divorce must be signed by both parties in the presence of a notary. Next, file the completed complaint and property settlement agreement with the chancery clerk in the county where either you or your spouse live. In addition, you will need to submit a filing fee with your completed divorce form at the time of filing. For divorces filed without professional legal assistance, Mississippi requires any children of the marriage to have a guardian ad litem appointed to represent their interests. A guardian ad litem is a Mississippi licensed attorney responsible for investigating the facts surrounding the best interests of the child in the divorce. The guardian ad litem will appear at all divorce proceedings and argue a position she believes represents the best interests of the child involving custody and visitation issues. Who Pays When Filing for Divorce in Texas? 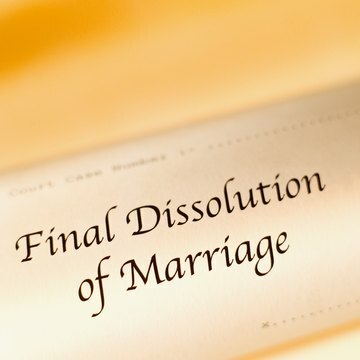 Divorce is the legal recognition that your marriage is over. In Texas, the person who files for divorce is typically the one responsible for paying the filing fee to start the divorce case. The amount that you must pay to file for divorce in Texas depends on the county in which you file, whether you and your spouse have children, and your financial situation.